When, in 2000, following an annual MRI scan, Wayne McCullough was diagnosed as having a cyst on his brain and told he might never box again, he began the longest struggle of his controversial career. The BBBC withheld his licence to fight in the UK, then, just when it seemed he would never box in Britain again, the decision was reversed. He returned to his beloved Belfast in 2002 to defeat Russian Nikolai Eremeev in a dramatic fourth-round victory. From his early life on the Shankill Road to training with the great Eddie Futch in Las Vegas, "Pocket Rocket: Don't Quit!" details the ups and downs of McCullough's life as a world champion boxer and as an ambassador for his sport and his country. Raised during Northern Ireland's troubles, in one of Belfast's toughest areas, McCullough chose to use his fists in the ring. In 1995 he finally achieved his dream when he was crowned WBC bantamweight world champion, beating Yasuei Yakushiji in Nagoya, Japan. Bringing a gentleness to an often gruesome sport, "Pocket Rocket: Don't Quit!" 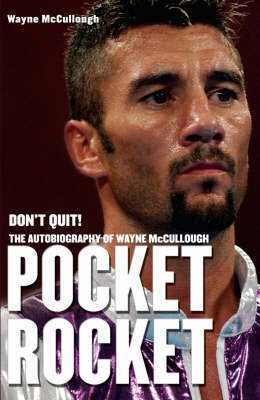 is an honest account of Wayne McCullough's life in his own words. He writes about Mat Tinley, the TV executive who took him to the States to embark on his boxing career as a pro, and gives an account of his major fights, including grueling contests against Naseem Hamed, Erik Morales and Scott Harrison. He describes the labour of love that has been boxing for him since the age of eight and looks to the future, after his second defeat at the hands of Oscar Larios. Will he have the chance to take back the six minutes of his boxing life that were stolen from him by the ringside doctor who stopped his 2005 title fight? McCullough has stood toe-to-toe with 11 world champions and remained on his feet to the end. "Pocket Rocket: Don't Quit!" reveals the character of a man regarded as one of the best pound-for-pound fighters of his generation.